Pain Physicians NY (Brooklyn, Queens, Manhattan, Bronx NYC) is one of the first practices in New York to offer advanced groundbreaking treatment for hip pain including latest compression and electrical nerve stimulation devices for Grade I and II hip strain, best osteoarthritis hip pain management options to prevent the progression of the hip arthritis. One of the body’s largest weight bearing joints, the hip is the joint which connects the thigh bone and pelvis. It consists of two parts acetabulum and the femoral head. Acetabulum is a bone socket on the pelvis in which the head of the femur fits perfectly. The femoral head is bone located at the top of the femur (thigh bone) and it has a shape of a ball. Ligaments connect the femoral head and acetabulum, stabilizing the hip joint and forming the joint capsule. 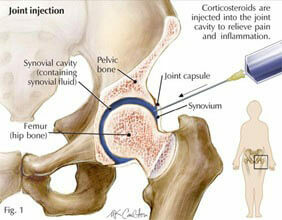 Synovium produces a vicious fluid which helps lubricate the joint. Bursa, which are sacs filled with fluid, provide the necessary cushioning between the bones, muscles and ligaments of the hip joint. The hip is surrounded by large and strong muscles of the human body which enable the joint movement. Muscles surrounding the hip joint are gluteal, iliopsoas muscle, quadriceps, hamstrings and adductor muscle. Major nerves and blood vessels of the human body also run through the hip, including the sciatic nerve, the femoral nerve as well as the femoral artery. If you experience chronic hip pain and haven’t found lasting relief through more conventional hip pain treatments, medical marijuana treatment offered by our doctors may be right for you. Call medical marijuana doctor Boleslav Kosharskyy MD of Pain Physicians NY with locations in Brooklyn, Queens, Manhattan and Bronx NYC to help you determine if medical marijuana treatment is right for your hip pain. The goal of our pain management specialists is to get you back on the track with minimal downtime. It all starts by diagnosing the cause of your problem. Necessary diagnostic examinations are all available in our clinic, so X-rays, Ultrasound, CT- Scan, MRI are routinely performed. A part of the diagnosis is also a complete medical history and a complete physical examination by doctors of our team. Once the right diagnosis is made, the treatment plan is determined based to your condition, personally. Conservative treatment is suggested first, and if conservative treatment provides no relieve invasive procedures like surgical treatment might be suggested. There is no point of suffering in silence. Make an appointment at Pain Management Brooklyn NYC. The most advanced pain management center, Brooklyn pain management doctors and specialists at Pain Physicians NY offer unique, individualized approach to manage your hip pain. We are using the most effective pain management and treatment options to treat hip strain, hip arthritis, flexor Strain, piriformis syndrome. We are utilizing the latest technologies available in USA.